Manpang People’s Militia, a military-back armed group, has been accused of forced recruitment in several villages in northern Shan State, according to an MP from the Shan Nationalities League for Democracy (SNLD). Sai Wan Leng Kham, an Upper House lawmaker for the SNLD representing Lashio Township, told Shan Herald on Tuesday that the enlistment policy started at the beginning of May. He said that the Manpang People’s Militia sent letters to local villagers’ houses with a list of names of persons they wished to recruit as soldiers. “They delivered a list of names,” he said. “Some families had already sent their sons to them. But others, who refused to send their children, asked us for help. So, we [MPs from Tangyan, Lashio and Mongyai] have sent a letter to high-ranking officers within the Burmese army. SNLD MP Sai Wan Leng Kham said that he didn’t know how many persons the people’s militia wants to enlist. He said the Manpang group are recruiting in their active areas such as Mongyaw, Nampong, Mongmao, Mong Dom, Wan Kard, Manthab, Wan Ben, Lukwai, Wanje, Honar Kongsar, Mong Pai, Don Nay, Nar Nang, Kun Hio, Nar Moong, Kong Mong, Khum Jong, Kong Mao, Peng Nyaung, Pang Hoong, Mong Geng, Nam Hoo Loi Kar, Pang Nyaung, Nong Liang, Mangpang and Nammuje, all of which are in Lashio and Tanyan townships. He said that some villagers believe the recruitment drive is for the Burmese army. However, the Manpang militia insists they are recruiting only for their own ranks. 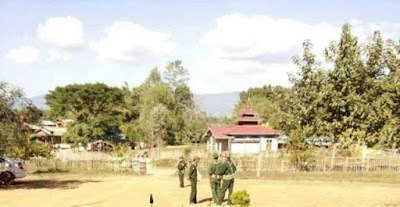 Reports circulated recently that villagers in southern Shan State’s Maukmai Township have abandoned their homes to seek refuge elsewhere, avoiding a similar conscription drive by the Restoration Council of Shan State/Shan State Army (RCSS/SSA). Gen. Yard Serk, the chairman of RCSS/SSA, denied such a practice. “What really happened was that the RCSS wanted to train village security forces so that these villagers could protect themselves. The villagers thought it was a good idea, but three village headmen thought otherwise and ordered them to flee,” said Yard Serk, whose army was among eight groups that signed a nationwide ceasefire agreement (NCA) during the tenure of President Thein Sein’s government. The RCSS/SSA has in recent months been involved in a series of clashes with government forces in southern Shan State. More than 20 clashes have been reported between the Burmese army and the RCSS/SSA since the Shan militia signed the NCA in 2015. Shan Herald reported in December that, in northern Shan State, hundreds of villagers fled their homes to avoid a recruitment drive by the Ta’ang National Liberation Army, also known as the Palaung Army, which has clashed regularly with Burma’s government forces in the area. Hundreds of People’s Militias exist at a local level throughout Shan State and are mostly supported by the Burmese army, which is entrenched in conflicts with several ethnic armed groups across the region.